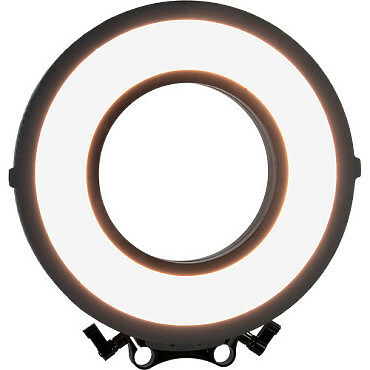 Made of durable lightweight metal, the 9.9" diameter C-318RLS Flapjack Bi-Color LED Ring Light Kit from FotodioX is built around a light source that uses Edgelight technology, which entails pointing LEDs toward the outer edge of the fixture and reflecting them back toward the middle for ultra soft results. This versatile light also has color that's variable from 3200 to 5600K while maintaining a CRI of 85 for faithful rendition of colors down to the subtlest hues. It's dimmable as well from 10-100%. A back-lit LCD indicator shows light level, color temperature and battery life status. The C-318RLS's central opening will fit up to 130mm-diameter lenses and a rod-mountable bracket is provided for your camera. At only 1/2-inch thick, the C-318RLS fits where other lights just can't go. And you can work close-up too, without fear of causing the talent discomfort, since running the light all day at full power barely makes it warm to the touch.